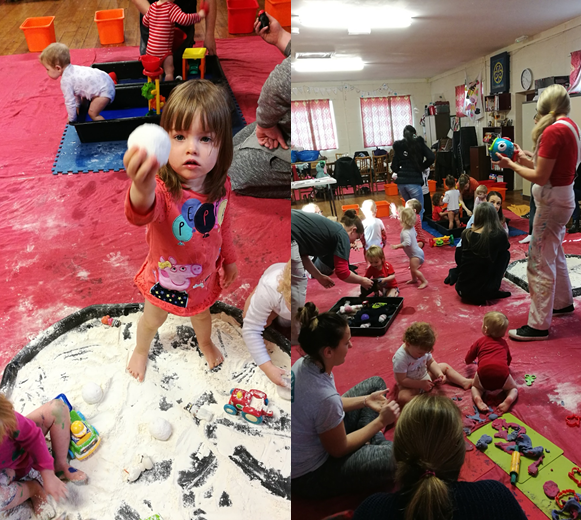 My daughter and I went to Jo’s Messy Monkeys class whilst I was on maternity leave and we both loved it, so I was sad when the time came to return to work and we could no longer go every week. Although attending the classes gave us lots of inspiration for activities to do at home thereafter, it has of course never been quite the same – not quite as messy (not intentionally anyway!) and not quite as much fun with me stressing over the status of the carpet and the ever-present risk of paint splattered curtains! So it’s safe to say I was delighted when class Jo invited us back to do a review of the class for Stockport Mumbler. Upon arrival we we’re given a warm welcome by Jo and the other mums and dads at the class (many of whom who have been attending the classes for 2+ years!). There’s a cosy area where the little ones can settle in and get ready for the session to begin (most little ones were in a nappy and vest, but it’s a case of whatever they are most comfortable in!). There’s a padded floor as well as lots of monkeys (the soft toy variety!) and monkey-themed books to keep everyone company in preparation for the class. The next thing to do is to sing the catchy Messy Monkeys welcome song “ooh ooh ooh Messy Monkeys, ooh ooh ohh Messy Monkeys, we love messy play!” (a welcome replacement to “hello my name is iggle piggle” which I can’t seem to get out of my head of late!). The little ones are then given a clipboard with a picture on to colour in with crayons as we sing the Messy Monkeys take on ‘Wheels on the Bus’. A different picture is used each week and there’s space to record your little ones name and age – this is not only a lovely thing to keep but a great way to see how their colouring changes month on month. 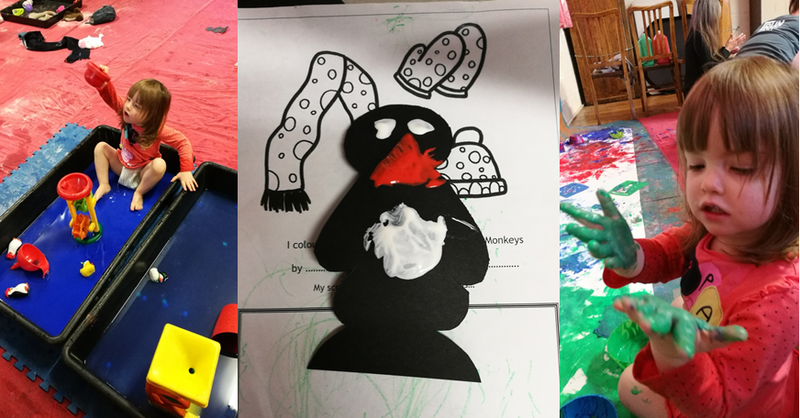 There’s a theme a each week, and this week it was Winter Wonderland: there was flour snow, penguins to be painted, ‘oat’ snow be shovelled and cleared, hats and gloves to keep us warm plus painting to be done and water to splash in! What’s not to love? My mini Mumbler held back a little at first as she took everything in and then started making shapes from the play doh. I was super impressed to learn that the play doh was home-made! She then headed over to the blue water tubs to join the penguins, and before I knew it she was over at the painting wall getting seriously messy whilst exhibiting her artistic skills! The session is very much unstructured – little ones can dip in and out of each activity as they please and can very much explore at their own pace (and let’s face it, they love being in charge!). All the materials are safe to be used under supervision. It’s a very laid-back yet fun atmosphere which was great for us as it helped my daughter get involved very quickly without feeling overwhelmed. So what about…the mess? Well fear not, Jo provides the little ones with a mini bath tub each, complete with warm bubbles to get clean ready for home time (not before singing the Messy Monkeys goodbye song, of course!). Then it’s time to get dry and dressed before heading home mess free after a fun-filled morning! My favourite thing about this class (apart from the fact I don’t have to do the cleaning up, obviously!) is that it really allows little ones to discover things in their own way, use their imagination and express themselves creatively as they feel most comfortable doing: there’s no pressure to paint, gloop or squelch in a certain way! When you think of little ones doing ‘messy play’ it’s easy to conjure up images of utter chaos, but because they are given the freedom to investigate the various materials and activities for themselves, they are so focused on what they are uncovering and all the new textures, (and yes of course there is lots of mess – the more so the better at this class!) it’s not the complete mayhem you might envisage! Jo is a brilliant class leader. Her relaxed and fun approach is infectious – not just for the children, but the parents too! It isn’t always easy walking into a new class where you don’t know anyone and you don’t know quite what to expect – and Jo puts you at ease instantly with her cheerful welcome and explanation of what happens at the class. It’s not difficult to see why many of the little ones have been with the class from the start 2 years ago! Definitely 5/5 stars from both my daughter and I! 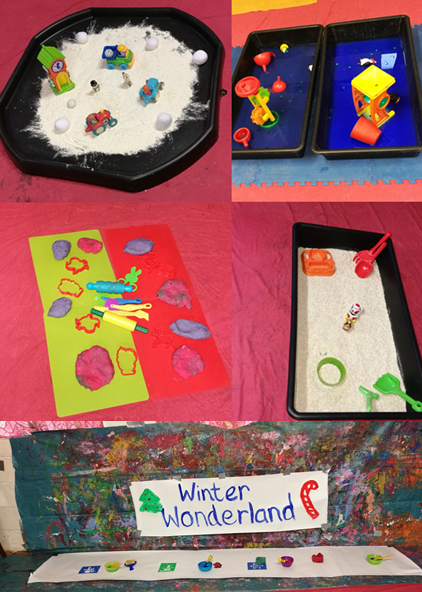 “Messy Play helps babies and toddlers explore their developing senses and their blossoming creativity in a fun and safe environment. At Messy Monkeys we allow children to explore different materials and textures that helps them to learn about the mechanics of the world around them… it might just look like a bit of a giggle but for babies and toddlers messy play is serious learning! Not only do children develop an early understanding of arts and crafts from messy play they also gain an insight into the basics of science and maths; learning about gravity, cause and effect, the difference between liquids and solids and how different substances react in different situations. At Messy Monkeys we concentrate on free and creative play as this is an essential part of a child’s learning process; messy play is a fabulous way of allowing young children to gain confidence in their own imagination rather than giving them structured, adult led activities. By focusing on the ‘process’ rather than the ‘product’ children gain confidence in their own choices and ideas, rather than simply trying to do what they think adults want them to do. People learn new things in different ways; some visually by watching others, some aurally by listening to information and others kinaesthetically by physically doing a task. Messy Play appeals to the kinaesthetic learner who isn’t always happy sitting and listening, but would rather be getting stuck in. The vast majority of babies and toddlers are kinaesthetic learners, hence their enthusiasm for getting messy! There is evidence to suggest that children who experience messy play from an early age are easier to wean onto solid foods, since if they are happy covering themselves with paint and glitter during their playtime they probably won’t mind being covered with spaghetti bolognaise at meal time! Messy Play can reduce the fear of exploring new textures, which is part of the battle some parents face in getting their children to try new foods. Jo runs weekly sessions in Bramhall, Cheadle Hulme and Heaton Chapel, and also offers messy birthday parties! Find out more on the Messy Monkeys website here. Disclosure: Messy Monkeys Manchester South did provide us with a free class for the purposes of this review. The opinion I’ve expressed here is my own.